Thermatex is a well-known name in equine circles. Thermatex horse rugs are a saviour on many yards. They are made of a breathable, wicking material which actually works. They’re warm. They look smart. They wash well. They are available in a whole range of colour combinations and offer customisation options. They are a flexible option as they can be used on their own, as coolers, as layers under other rugs and as travel rugs. Everyone wants a Thermatex. 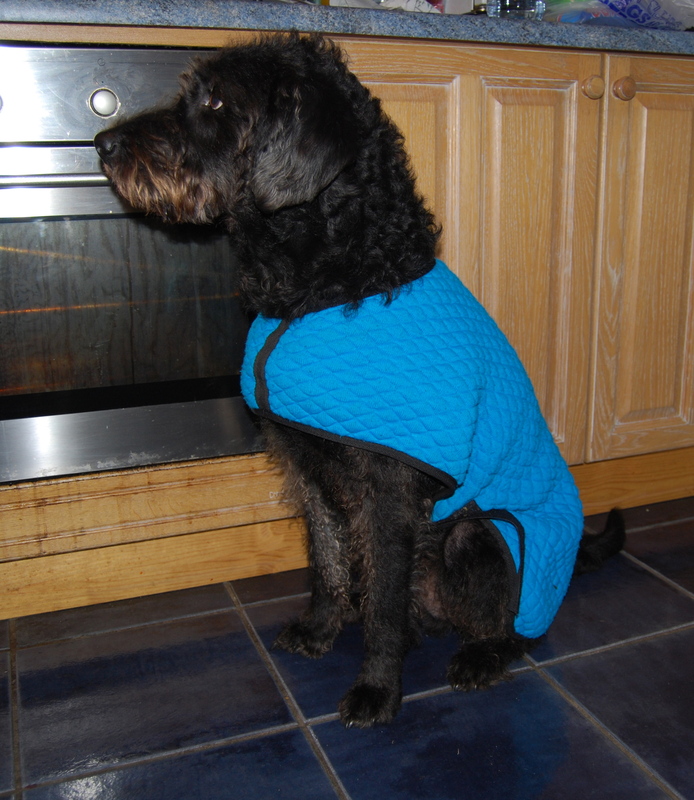 So, when I got myself a dog who loves to get himself wet and muddy, I was delighted to discover Thermatex make dog coats from the same magical material. It has been everything I was promised and more. If you’re looking for a coat that easily dries your dog off without the risk of him overheating afterwards, then this is the dog coat for you. The wicking material leaves your dog dry and warm, but is also breathable. Perfect for not only the winter, but also autumn and spring days. I’ve washed it more times than I can remember and it has never shrunk, and the bright blue colour has not faded. I have never tried to tumble dry it because it is bone dry in a couple of hours. Rory is happy to wear it for hours, which is a new thing for him as he usually tries to chew coats off. On the left, he is wearing it in our holiday cottage after a long Scottish walk. It might have something to do with fact these rugs are made of one piece of material and have no central seam, specifically designed to avoid rubbing and make them as comfortable as possible. It does up with a simple velcro fastening that leaves plenty of room for deeper chests – necessary for Rory, he is half poodle after all. I’ve used it after baths in the house, under other dog coats for layering in the car and my friend has walked him in it. It is possibly the most practical dog item I own… and I own a lot of dog stuff. Rory’s coat is an off-the-rack option that I bought at a horsey event, but if you are willing to wait you can choose the material colour and the binding colour, and it will be made to order at no extra cost. You can add double-binding, cross-surcingles or embroidery, too, but they are extra. Dog coat prices start at £13.95 and for bigger dogs it’s not a cheap option, but the value for money is off the scale. A note of caution, Thermatex coats are measured differently from other dog coats, so if in doubt give them a call. They will probably want the measurement from the centre of your dog’s chest to where you want the rug to end. If dog coats aren’t really your thing, they also offer dog bags made of the same material – just zip your dog in and keep your boot mud free while drying him at the same time. I kid you not. Review: Thermatex Dog Coat | Live. Love. Learn. Write.